OnePlus Reveals Spare Parts Prices Publicly! How often have you been worried about an issue in your smartphone you’re not sure will be economically fixed or not? Everyone faces this dilemma at one point or the other, since smartphones too are just machines and get wear and tear over time. None of the smartphone multinationals till date have bothered about displaying or publishing the spare part price list on their website or in service centres, often leading to people using fake parts or overpaying for the parts and services. 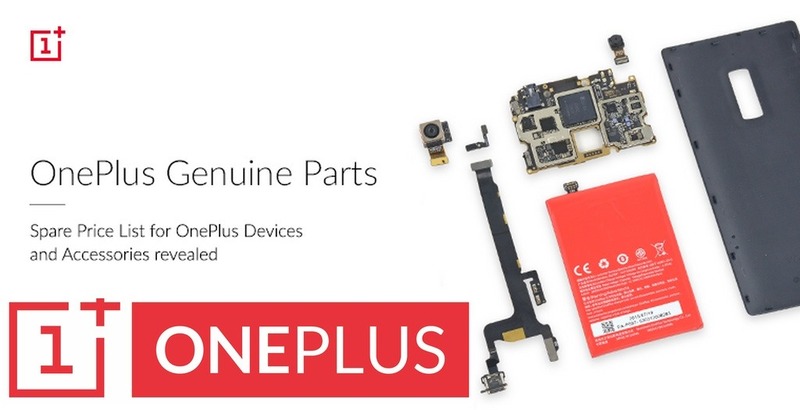 OnePlus, with first of its kind initiative in the industry, has revealed the price of its genuine spare parts to help customers get the correct rates anywhere they want to get their phone fixed. This also means that there will be assurance of quality and uniformity at service centres. The price list contains the price of the spare part, along with a labor fee, which will be levied one time in case of repair of multiple parts. The prices given are excluding tax, since every state has a different tax rate, confirmed OnePlus. On the blog, OnePlus communicated, “The past year was a step in the right direction for our company when we set out to realign our priorities by setting up fantastic customer care centres across the country for our patrons. While we’ve separately announced blogs highlighting the ramp-up, we still feel that we can do a lot better on this front and we will leave no stone unturned to achieve this.” It looks like OnePlus is going towards a direction of complete transparency to achieve not only higher sales, but also make an impact on the general public of the country. Apple has been making a profit of nearly $513 for every iPhone 6S Plus it sells, making it over 217.4% margin on every device. On the other hand, OnePlus is not making such profits and is only aligned to provide inexpensive after sales service to its customers. Think about it this way, next time you broke your front camera on a OnePlus device, you would know how much it costs to replace it with a genuine spare part. OnePlus, on its blog, also mentioned that customers should visit only B2X Service Solutions India Pvt. Limited and Regenersis India centres for any grievance or support issues for speedier resolution. These are the service centres that will provide you with all the help for your OnePlus smartphone. In case anyone is charging more than the price mandated by OnePlus, excluding tax, the issue can be raised on their toll free number or by sending a mail to their support group. "OnePlus Reveals Spare Parts Prices, A First in Smartphone Industry", 5 out of 5 based on 8 ratings. How Smartphones Have Drastically Changed in Just a Year!